Create or use an existing course. Click on Add an activity or resource link. Select File under RESOURCES and click Add. Note the description field smaller than usual (less rows). Also the content section has been removed and the Select files is now under General header section. Fill the form and Save. Make sure the file was saved and all the information is correct. 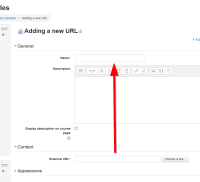 Select URL under RESOURCES and click Add. Also the content section has been removed and the External URL is now under General header section. Make sure the url was saved and all the information is correct. File resource Create or use an existing course. Click on Add an activity or resource link. Select File under RESOURCES and click Add. Note the description field smaller than usual (less rows). Also the content section has been removed and the Select files is now under General header section. Fill the form and Save. Make sure the file was saved and all the information is correct. URL resource Click on Add an activity or resource link. Select URL under RESOURCES and click Add. Note the description field smaller than usual (less rows). Also the content section has been removed and the External URL is now under General header section. The button Choose a link... got removed. (not any more) Fill the form and Save. Make sure the url was saved and all the information is correct. During the usability study users were asked to add a video to the course using a given URL. There are a number of ways of doing this, but all participants (after looking for a video resource module) eventually used the URL resource. Some had trouble with this, however, adding the URL to the description instead of the External URL field. The same issue applies to the File resource, with the file manager potentially off the page. This was a significant issue for 1/6 participants and a lesser issue for one more.